This article was written By John Berra on 18 Dec 2012, and is filed under Features. 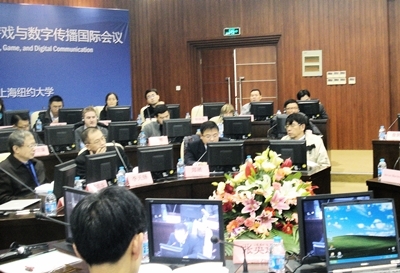 Held from December 8-9, 2012, the New Media and Cultural Transformation: Film, TV, Games, and Digital Communication conference, was organised by the School of Film and Television at Shanghai University in participation with New York University Shanghai, with the intention of furthering academic discussion related to participatory culture. This interdisciplinary event was arranged by Professor Shaoyi Sun, co-author of the essential Lights, Camera, Kaishi! : In-Depth Interviews with China’s New Movie Directors (EastBridge Press, 2008), in order to address questions regarding the continued impact of new media on the arts and modes of communication in the 21st century. His ambitious call for papers attracted an enthusiastic response from scholars of various backgrounds, resulting in a stimulating conference that facilitated a productive exchange of ideas and research findings within the context of a constantly evolving field. New media is an academic area that almost defies finite definition, although Henry Jenkins has provided the foundation for appreciating its limitless reach in his landmark study Convergence Culture: Where Old and New Media Collide (New York University Press, 2006) which outlines the links between behaviour, interaction, and production in the internet age. An observation made several times during the conference was that ‘New Media’ is actually no longer new, and that most people younger than the assembled academics do not even use the term, making debate regarding digital frontiers a vital addition to the conference calendar. What follows is a brief summary of some of the papers that I had the pleasure of hearing at Shanghai University’s International Conference Hall over the course of this informative two day event. Steven Shaviro (Wayne State University, USA) presented on “Post-Continuity: Digital Aesthetics and Mainstream Hollywood Film”, examining the fragmentation, or even abandonment, of continuity in commercial action cinema that has resulted in a new organisation principle. Michael Fitzhenry (United International College, Zhuhai, China) discussed the sponsorship of micro films for cell phone distribution, making this mobile communication interface a viable new channel for art exhibition. Yingjin Zhang (Shanghai Jiaotong University, China/University of California, San Diego, USA) focused on the work of documentary pioneer Wu Wenguang with “Ethics of DV Documentary in Contemporary China”, distinguishing the four different sets of relations that constitute the director’s oeuvre. Earl Jackson, Jr. (UC Santa Cruz, USA/National Chiao Tung University, Taiwan) explored “Technopoetics: The Special Affects of Media-ted Screen Imaginaries”, with reference to Satoshi Kon’s fever dream anime Perfect Blue (1997) and the virtual pop idol Aimi Eguchi. Andrew White and Bjarke Liboriussen (University of Nottingham Ningbo, China) considered “New Media and Domains of Creativity in China”, questioning whether the creative industry models developed by the West can be applied to China, where the Shanzhai approach is currently thriving. Shi Hantao (Chronus New Media Art Center) presented on “Social Media and Art: On Miao Jiaxin’s Work”, providing insight into the performative methods and web celebrity of a challenging photographic artist. Yang Ling (Xiamen University, China) delved into Japanese manga with “The World of Grand Union: Engendering Trans/nationalism via Boys’ Love in Chinese Online Hetalia Fandom”, noting how such series have been appropriated by Chinese readers and viewers to discuss domestic politics. Other topics included animation, digital publishing, shadow economies, and the use of Weibo (micro-blog). The informal atmosphere of the conference made it an excellent event for networking, while an optional evening activity at the RockBund Art Museum in Huangpu District provided an opportunity to see an acclaimed documentary in a sociable environment. ‘All Tomorrow’s Parties: Summoning Creativity in Shanghai’ is a series initiated by Anna Greenspan and Francesca Tarocco (New York University Shanghai) which examines the creative clusters of the city through film screenings and panel discussions. 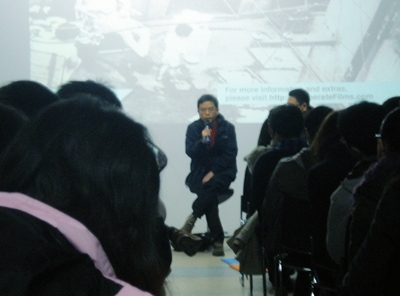 December’s event was a screening of Haolun Shu’s moving documentary Nostalgia (2006), a loving reflection on his family neighbourhood of Dazhongli, with the director capturing as much of the area as possible during a period of regeneration that would see its courtyards replaced with shopping malls and towering skyscrapers. There are links between Nostalgia and Shu’s recent narrative feature, the heartfelt coming-of-age drama No. 89 Shimen Road (2010), which also deals with the social-political fabric of Shanghai during a period of transition (the late-1980s), with events taking place in a neighbourhood that has since vanished. Both films feature neighbours and elderly family members who constitute a ‘living history’ as the city erases its past in pursuit of modernisation. In a post-screening conversation with Yingjin Zhang, the director discussed his methods, notably his use of music and photographs that give the title of his film a dual-meaning in terms of its yearning for earlier modes of expression or documentation. Overall, this was a very successful conference that provided a suitable forum for the latest research on the production, distribution, and consumption of new media in the era of global exchange.